Do you massage your face? It may seem like a stupid question, because I personally never thought about it. Facial massage seems pointless. Really rarely we decide on traditional body massage not to mention facial. Sadly, I noticed such tendency and I would really like to change that! 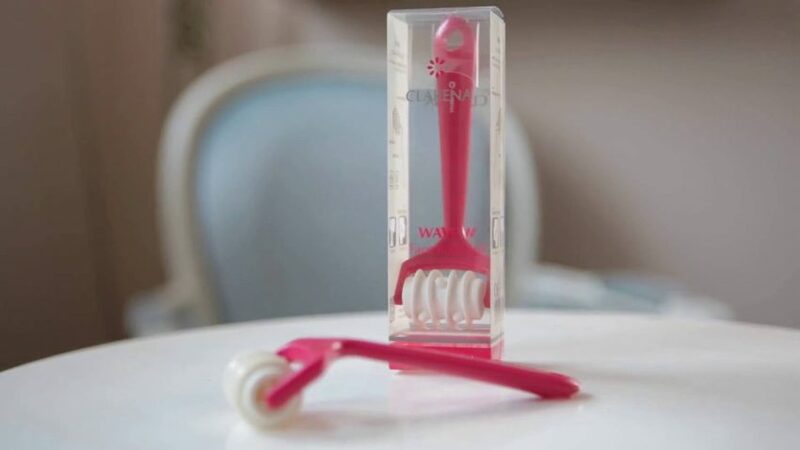 Let me introduce solution that should convince anyone to facial massage – handy Wave Roller from Clarena. What can I say about this product? All the good staff! Let me start at the beginning, i.e. detailed presentation of the subject. Wave Roller is a product that can be bought easily online. I bought mine on eBay for around £11.00, so I think I can recommended to everyone. It is a great alternative for expensive and non-effective massage devices you can find online. The roller is just like you see it – stiff grip and shaped spinning part. Wave Roller is based on the same rule as other rollers for facial massage. However, despite all I consider it to be much easier solution. Why? The grip was designed in such way that it really well lies in hand and your arm does not get tired during long massage. Roller Clarena can be hung in a visible place (I hung mine on the hanger next to the mirror in the bathroom), because grip was equipped with a hole. As to the roller itself I can only say that it is amazing. It fits face, neck and cleavage perfectly. Shaped properly head, not only compresses skin but also gently skims it. Very pleasing! Use of this gadget is really relaxing and Wave Roller took its deserved place among other conditioning accessories of mine. One more thing! I have to say that cleaning of it is trouble free, you just need warm water. I encourage everyone to use of this roller, because it fulfils its task in 100%. Not only relaxes, but also tightens skin in a very pleasant way. Skin becomes truly delicate. What is more, creams absorb much faster and provide better results.